Can I do anything to protect myself from getting AMD? I have heard that AMD can be 'wet' or 'dry' - is this right? The macula is an area at the back of your eye that you use for seeing fine detail such as reading a book. Macular degeneration (MD) covers a number of conditions which affect the macula. The conditions affect your ability to do certain tasks such as reading and watching television, but does not affect your ability to walk around as your side vision is not affected. One of the most common symptoms of MD is noticing that straight lines appear wavy or that there are patches missing from your vision. You may not notice this if it happens in one eye as your other eye will compensate, so it is important to regularly check your vision in each eye separately. You can do this by looking with each eye separately at the straight lines on a door frame or Venetian blind. If you notice the lines are distorted or there are missing patches, you should see your optometrist straight away. Macular degeneration (MD) happens when the macula at the back of your eye becomes damaged. This can make it harder to see fine detail, such as recognising faces, or to read or watch television. However, this does not normally affect your ability to walk around as the edge of your vision should not be affected. The most common forms of MD happen more as you get older and are known as age-related macular degeneration (AMD). Around one in 10 people aged 65 or over show some signs of AMD. Some younger people may have MD caused by a genetic condition but this is less common than AMD. Some people simply notice that things appear blurry or they have difficulty reading, even with their normal reading glasses. Other people may notice that they have a smudge in their central vision which does not go away, or they may notice that straight lines are distorted or wavy. Some people with AMD may notice that they become sensitive to bright light, or that they find it difficult to adapt when going from a dark to a light environment. Some people notice that colours can fade. These symptoms are more noticeable if you look for them with each eye separately, because if you have both eyes open then the better eye may compensate for the other one. We recommend you check your vision on a regular basis by looking at some detail, such as a book or magazine and covering each eye in turn. This will help you notice any changes in your vision early. Smoking is known as a major risk factor for developing AMD so if you smoke, try to stop. It is also believed that having a diet that is rich in coloured fruit and vegetables (for example, kale, spinach, celery and broccoli) may reduce your risk of developing AMD. A link has been found between obesity and AMD so you should try to maintain a healthy weight. Other factors that increase your risk of developing AMD include having a family history of the condition. It is slightly more common in women than men. It is possible that exposure to ultraviolet light may be linked to AMD so we recommend you wear UV-absorbing glasses when you are going to be outside for long periods. There are lots of dietary supplements on the market which claim to be beneficial for eye health. They may be helpful for some people. Discuss whether or not that may be helpful for you with your optometrist. You should note that if you smoke or have been exposed to asbestos you should not take beta carotene. AMD can be classified as early or late. Early AMD is always dray AMD. This is when yellow deposits, known as drusen, build up behind the macula. Most people with early AMD have near normal vision. There is no treatment for early AMD. A minority of people with early AMD can progress to late AMD. Late AMD may be 'wet' or 'dry'. The commonest form of late AMD is the wet form. This happens when abnormal blood vessels begin to grow behind the macula and leak fluid. This pushes the macula away from its blood supply at the back of your eye and causes a rapid loss of vision (straight lines become wavy, or you have a blank spot or smudge in the centre of your vision). You can check this yourself by looking at straight lines such as door and window frames or Venetian blinds. 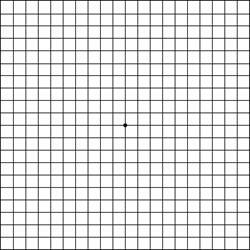 Or, you can look at a grid of squares printed on paper, called an Amsler grid. Your optometrist will be able to advise you on this. It is important to do this with each eye separately and while wearing your glasses, if you need them. Wet AMD can be treated, so if you notice these symptoms, you need to see your optometrist straight away. Late dry AMD is called geographic atrophy and is rarer than late wet AMD. This is where you loose vision because the retina at your macula thins but there are no leaking blood vessels. There is no treatment for geographic atrophy. Cover each eye in turn. With the other eye look at the black dot in the middle of the chart. Are all the lines straight? Do you see any distortion, or any broken or wavy lines? Do you see any missing patches? If you see anything unusual, you should contact your local optometrist straight away. There is currently no treatment for dry AMD. Lighting is very important and you may find it easier to read if you have good light at home, or sit near a window to read. If the dry AMD is interfering with you ability to see fine details, your optometrist can advise you on special magnifiers which can help you. Organisations link the RNIB or local services can provide you with equipment that can help you manage your day-to-day tasks. Your optometrist or GP will give you advice on contacting these services. Wet AMD can often be treated if it is caught early enough and this is normally done by injecting a drug into the gel inside your eye. This shrinks the new blood vessels that are pushing the macula away from the back of your eye. You may need to have this repeated every four weeks for a few months. This will be provided on the NHS. It is important to spot any changes early by checking the vision in each eye separately and contacting your optometrist immediately if your vision suddenly becomes distorted or you have a blank spot in your vision. If you have wet AMD, your optometrist will refer you to a specialist eye doctor, known as an ophthalmologist. The ophthalmologist will decide if you need treatment by taking some scans of the back of your eye to show the thickness of the retina. They may also inject you in your arm with some special dye to see how this travels through the back of your eye, while taking a series of flash photographs of the inside of your eye. If you find you are struggling to see things because of poor vision, ask your doctor or optometrist for details of your local low vision service. RNIB can also give you advice on the help that is available. Contact the RNIB on 0303 123 9999. For support in your local area, and more information about AMD contact the Macular Society.